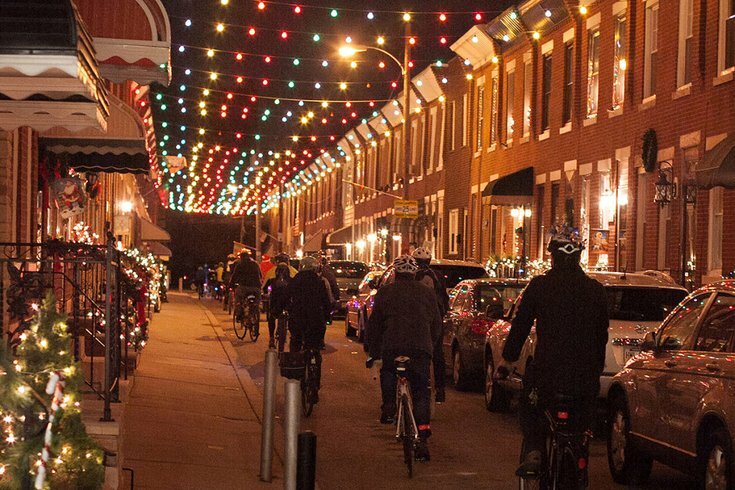 The Bicycle Coalition of Greater Philadelphia's annual Holiday Lights Ride loops through South Philly. Don't deck the halls with boughs of holly. This December, deck your bike out with twinkle lights, bells, reindeer antlers, tinsel and whatever other festive decorations you can find. The Bicycle Coalition of Greater Philadelphia's annual Holiday Lights Ride will take place Wednesday, Dec. 12. The 7-mile group ride loops through South Philly, where blocks go all-out with light displays. In total, the excursion should last about two hours. For the ride, participants are encouraged to dress in their most festive attire – and wear tons of layers since it's mid-December. The Holiday Lights Ride is free to attend with an RSVP, but $5 donations to the Bicycle Coalition are welcome.